The code in this article consumes classes from Microsoft ASP.NET 2.0 AJAX Extensions framework, and the Microsoft AJAX Control Toolkit. 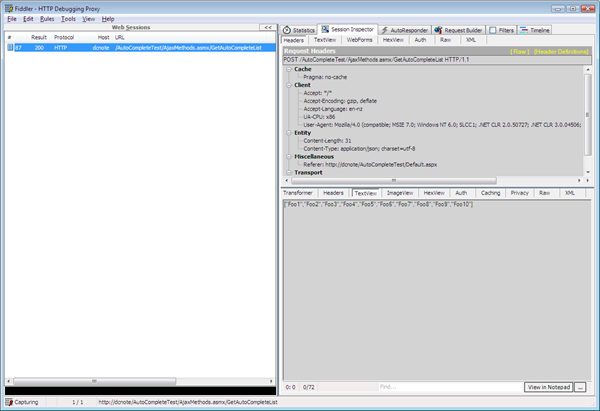 You are given the option to install the ASP.NET 2.0 AJAX Extensions framework as part of the RAD Studio 2007 install process. If this hasn’t been installed already, the installer can be obtained from the RAD Studio 2007 installation DVD, or downloaded from the ASP.NET AJAX downloads page. The Microsoft AJAX Control Toolkit is not included as part of the RAD Studio 2007 installer, so this will have to be downloaded from the ASP.NET AJAX downloads page. 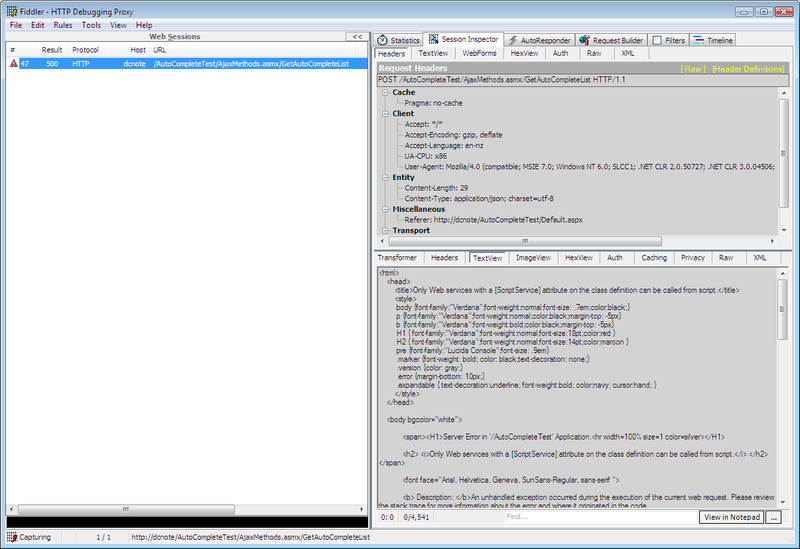 Once the AJAX Control Toolkit has been installed, the controls can be installed into the RAD Studio 2007 IDE so they can be used with the ASP.NET designer. 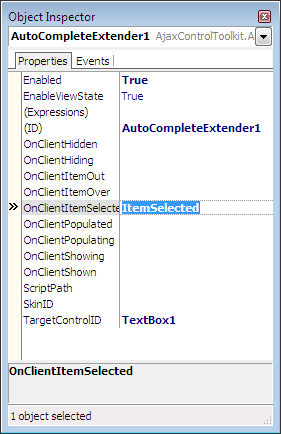 To do this, select Components->Installed .NET Components from the IDE main menu. On the .NET Components tab, enter ‘AJAX Controls’ in the Category textbox. 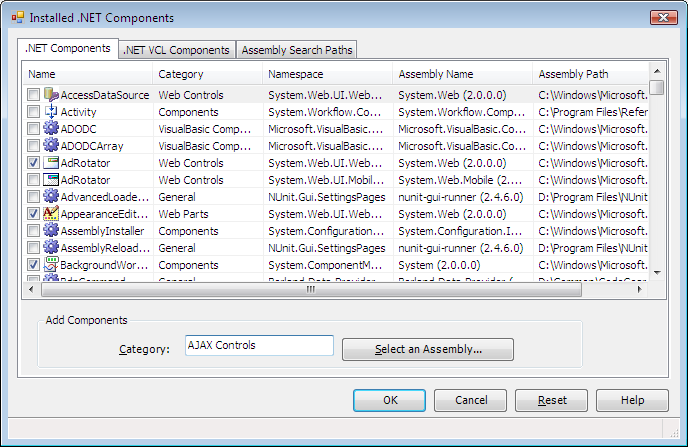 Click the Select an Assembly button, navigate to the directory where the AJAX Control Toolkit was installed, and double-click on the AjaxControlToolkit.dll assembly. We should now have a new AJAX Controls Tool Palette category available to us which contains a plethora of AJAX enabled web controls. Developing and debugging AJAX applications can be a frustrating experience at times. If there is a configuration or code error, it is common for AJAX calls to silently fail with no indication of what went wrong. In order to assist with this, we will use the Fiddler HTTP debugging proxy, which is freely downloadable from here. Once Fiddler has been installed, it will enable us to monitor the HTTP communications between the browser and web server, including any HTTP errors which may be preventing our web application from behaving as we expect it to. 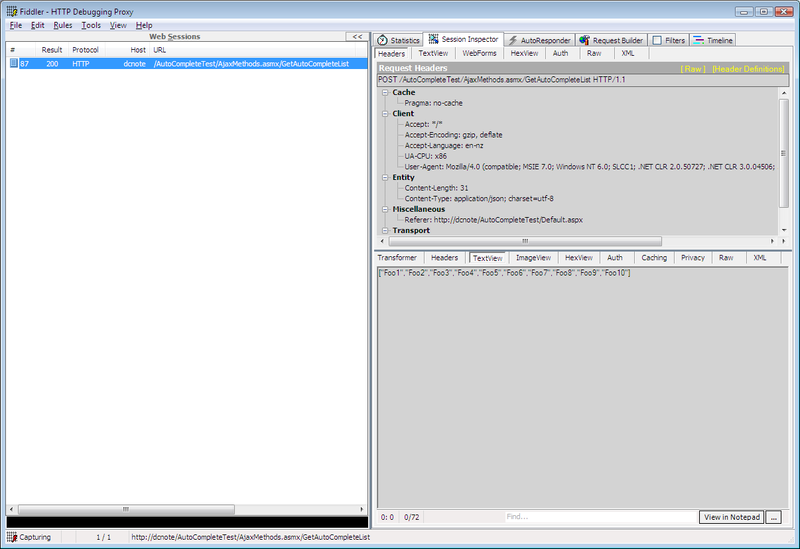 Fiddler can be invoked directly from Internet Explorer. It can also be used with other web browsers such as Firefox, but these may require additional configuration to ensure all HTTP requests are routed through Fiddler. Once we have our development environment configured, we can create our first AJAX enabled web application. Select File->New->Other… from the IDE main menu. 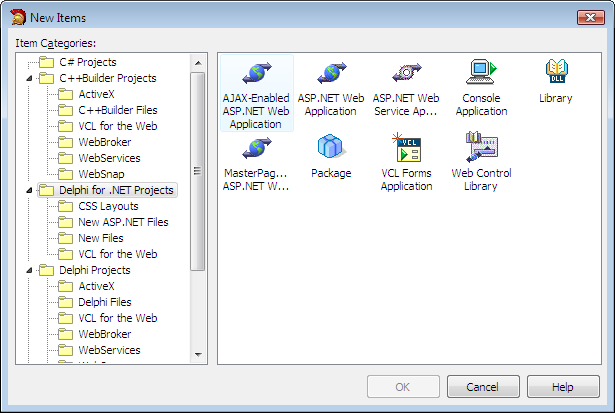 Expand the Delphi for .NET Projects node, and double-click on the AJAX-Enabled ASP.NET Web Application icon. When prompted for the project name, type AutoCompleteTest and click the OK button. The AJAX-Enabled ASP.NET Web Application template would have created a Default.aspx page which contains a ScriptManager and UpdatePanel control. For this application, we don’t need the UpdatePanel control, so select this in the ASP.NET designer, and press the Delete key. As the AutoCompleteExtender control extends the functionality of the System.Web.UI.WebControls.TextBox control, we need to add a TextBox control to our web page. The AutoCompleteExtender control will be dropping down a list of available entries for the user to choose from, so we will disable the standard auto-complete functionality the TextBox control supports. To do this, set the TextBox.AutoCompleteType property to Disabled. Next we need to add an AutoCompleteExtender control to the web form, and associate it with the TextBox we’ve already added. 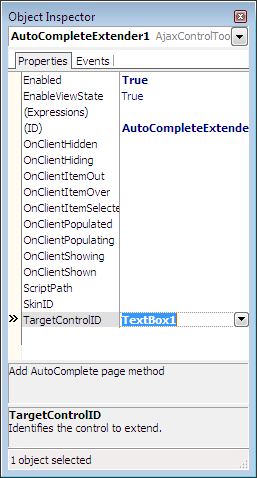 This is done by setting the AutoCompleteExtender.TargetControlID property to the name of the TextBox. There are two ways to provide a server-side method for our AutoCompleteExtender control to call. The first is to implement a web service method which it can call, and the second is to implement a method in the class implemented in the code behind file for our web page. This article will demonstrate both approaches. Right-click on the AutoCompleteTest.dll node in the Project Manager, and select Add New->Other…. Expand the Delphi for .NET Projects node, and select the New ASP.NET Files node. Double-click on the ASP.NET Web Service icon. 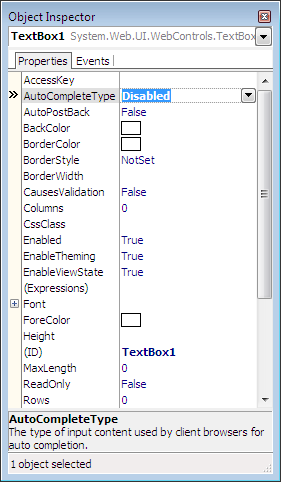 Type AjaxMethods.asmx in the Name textbox, and click the OK button. This will be the type we return in the function call used to determine the list of items to show in the auto-complete dropdown. The prefixText parameter indicates the text that the user has typed into the TextBox control, and the count parameter indicates the maximum number of elements to return in the string array. While you can use any name you want for the method, it is important to use the exact parameter names and case as shown above, otherwise the AJAX Extensions Framework will be unable to resolve the parameters when making the web service call. It is also possible to create an overloaded version of the above method which also passes a contextKey string parameter. If this parameter is passed, you will also need to set the ContextKey property of the AutoCompleteExtender control in your .aspx file. This provides a mechanism for each AutoCompleteExtender instance to signify context to the web service method implementation. This implementation is for demonstration purposes only, and will simply return an array of strings, with the size determined by the count parameter, and each array item consisting of the specified prefix parameter with its array position appended to it. The important thing to note here is the definition of the servicemethod and servicepath attributes. These denote the name of the web service method, and location of the web service .asmx file respectively. Now it is time to run our application to see whether it works as expected. 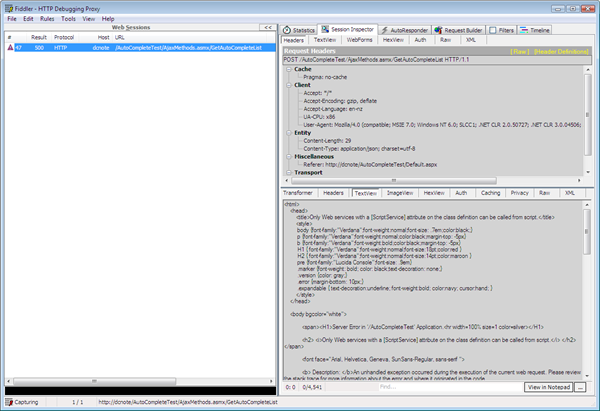 Select Run->Run from the IDE main menu to launch it in a web browser. Set focus to the TextBox, and start typing. As you will quickly discover, we have not quite finished the implementation yet, and no auto-complete dropdown will be shown. This provides the perfect opportunity to introduce how Fiddler can be used to determine what has gone wrong. Fiddler can either be launched from its Start Menu program icon, or if you are using Internet Explorer there will be an option to launch it directly from there (in IE7 for example, there will be a Fiddler2 icon on the Command Bar). NOTE: When using Fiddler to debug local web applications, it is important to remember that Internet Explorer 7 and the .NET Framework are hardcoded not to send requests for localhost through any proxies. And because Fiddler installs itself as a proxy, this means it won’t be able to intercept any such traffic. The easiest way to get around this is to refer to your local machine name in the URL instead of localhost. Once Fiddler has launched, switch focus back to the web browser and type in the TextBox again. Now switch focus back to Fiddler, and you should see an entry in the Web Sessions list for a HTTP call to our web service method, which failed with a result of 500. Double-clicking on the entry will expand the information in the Session Inspector tab, and will allow us to see what went wrong. The top section shows the request, and the bottom section shows the response. By default the TextView tab will be shown in the response section, and that tells us exactly why the call failed. The title element of the returned HTML states that “Only Web services with a [ScriptService] attribute on the class definition can be called from script”. NOTE: If you are using Firefox with the FireBug plug-in installed, the failed HTTP web service call would be shown in the Console tab. And by expanding this entry, you will be able to see the HTML response sent indicating the error. As an alternative to using a web service to expose the server-side methods for the AutoCompleteExtender control to call, it is possible to implement a page method in the code-behind class for the page. In order to demonstrate this, we will add additional TextBox and AutoCompleteExtender controls to our page, and will configure the AutoCompleteExtender to use a page method instead of calling our web service method. 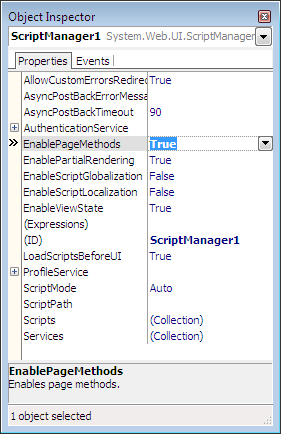 We will also need to set the ScriptManager.EnablePageMethods property to ‘True’. The method itself must be implemented as a static class method, and must be decorated with the System.Web.Services.WebMethodAttribute attribute. Having to apply this attribute should give a hint as to how the AJAX Extensions framework implements a page method call. Instead of forcing us to create an explicit web service interface, it will automatically create one from the static method we’ve declared in our code-behind class, and make that available to the AutoCompleteExtender client script code. We have also added some code which will allow us to see how to handle exceptions thrown during the AJAX call. This can be invoked by typing ‘error’ in the TextBox, and selecting any item in the drop-down list. As you can see, the arg argument offers quite a bit of information to assist with diagnosing exceptions, including the class type of the exception, any message text associated with the exception, and a stack trace if available. As with the server method used to populate the drop-down list for the AutoCompleteExtender control, you can implement other AJAX server methods as page methods. This is done in the same manner, with the method declared as a static class method decorated with the WebMethodAttribute attribute. The RaiseCallbackEvent procedure is the entry point to the server-side code invoked from the client, and the GetCallbackResult function is responsible for returning a result back from the server to the client. The interface allows for a string parameter to be passed to the server, and a string result to be returned back to the client. Once again, we are only using trivial proof of concept implementations here. When the RaiseCallbackEvent method is called, we build up the string result to return back, and store it in a private string member variable (which will need to be added to the private interface section). GetCallbackResult then simply returns the value of this variable. Once again, we use the sender._id property in the ItemSelected method to determine which server-side callback method to invoke. And in the client-side callback method, we simply show the result in a message box. 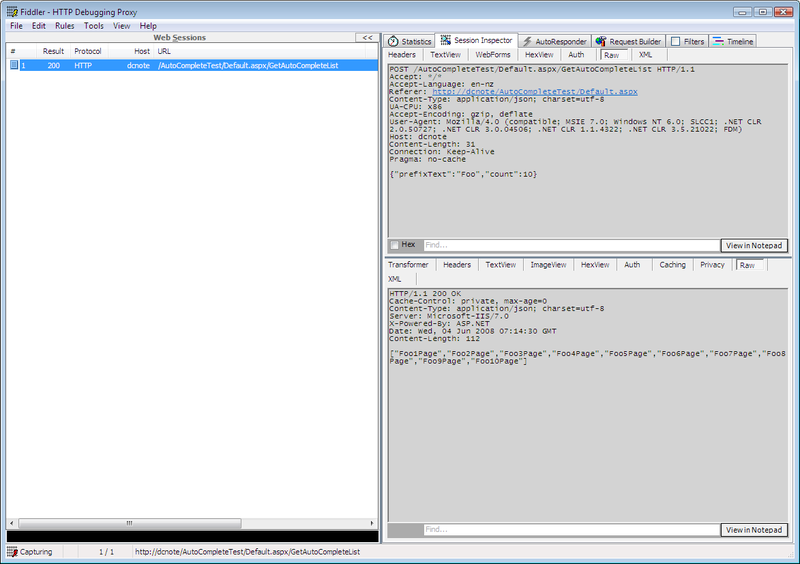 It also demonstrated how the Fiddler HTTP debugger and FireBug Firefox add-in can be used to assist with developing and debugging AJAX enabled web applications. The full source code for this article can be downloaded from CodeCentral. Felix, try hard refreshing with Ctrl+F5 and the buttons should be in the correct place. If this doesn't resolve it, please let us know which browser and version you're using. Thanks.